I've always been fascinated by low molecular weight gelators. These are small, non-polymeric molecules that easily outperform the long-chained cousins when it comes to making gels. They are surfactant-like molecules that because of intermolecular interactions, build large networks at low concentrations, maybe just a few percent. Here's one that I've worked with in the past: 12-hydroxy stearic acid (12-HSA). Stearic acid is already well known as a surfactant of sorts capable of forming micelles with the acid groups all aligned up at one end and thereby forming a 3-D structure of limited strength. The associations and hydrogen bonding are all located only at one end of the molecule. By adding the hydroxyl groups along the chain, hydrogen bonds can now form further away from the head of the molecule and stabilize the entire system of molecules, much like nailing a board in two spots is better than in just one. I have seen ultrahigh molecular weight PE gel mineral oil at low percentages, but that is clearly an exceptional polymer. Any non-crosslinked polymer of normal molecular weight can't make gels at such low concentrations. As with the 12-HSA, there is a polar segment and a non-polar segment - in this case, 2 of them [*]. The article has the usual hype of how this can be used in oil spill cleanup... completely overlooking that this material has never been evaluated for environmental toxicity or other effects, or even used with crude petroleum, let alone any of the other short comings already mentioned in the article. 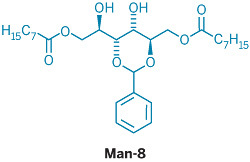 Still, it is a neat molecule capable of rheological changes that polymers can only dream of.